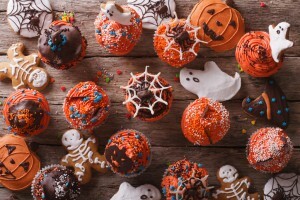 Halloween is around the corner, so it’s time to break out some recipes for spooky and sweet treats! 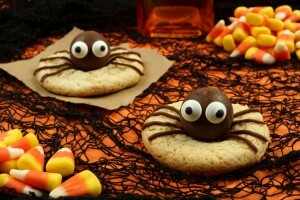 Reams has you covered this season with some of our favorite Halloween recipes that kids and adults alike will love! Check them out below! Looking for a sugary yet healthy treat? Well, look no further! 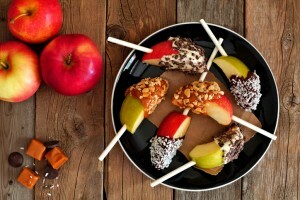 Try these delicious chocolate dipped apple pops! Place the white chocolate chips in a glass bowl along with the remaining ½ teaspoon of coconut oil. Remove and stir then place back into the microwave for 20 seconds. Remove and stir then place back into the microwave for 10 seconds. Remove and stir until completely melted. Sprinkle toppings over the top of each dipped apple pop. 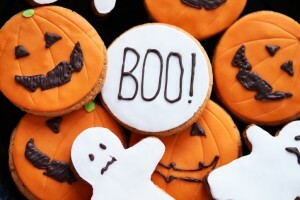 Here is a cute cupcake recipe that is equal parts spooky and sweet! Transfer frosting into a bowl, microwave for 10 seconds, and stir; repeat until thin enough to pour. Dip cupcake upside down into frosting, submerging the top but not touching liner to frosting. Let excess drip off before turning upright. Continue until all cupcakes are glazed. To Make the Cake Topper: Microwave white-chocolate chips in a bowl for 30 seconds and stir. Continue to microwave in 20-second intervals until almost melted. Stir again until chocolate is completely melted. Pour inside a freezer bag with one tip snipped off to create a piping sleeve. Line a cookie sheet with parchment paper. Slide spiderweb template underneath paper. To make each web, use piping sleeve to trace white chocolate along design, making sure to connect all lines. Repeat process until you’ve created 24 toppers. Chill them in refrigerator for 10 minutes. Then, using a spatula, remove webs carefully from parchment and position one on each cupcake. Time to break out the #PSL for fall! 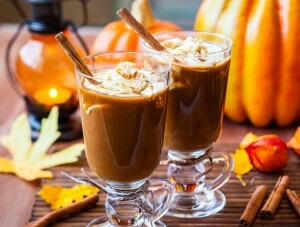 Stay awake for all the trick-or-treaters with a little boost of caffeine with this Homemade Pumpkin Spice Latte! Everyone loves peanut butter cookies! Spice it up with a cute little spider topper and enjoy your holiday season! After placing and moving all the cookies on the wire rack, put in place the candy eyes while chocolate is still slightly soft. Clip tiny piece off the corner of bag to allow for piping and draw eight legs on each spider cookie.